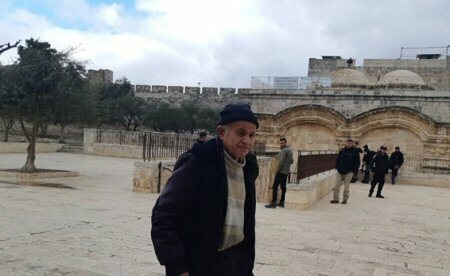 Israeli forces detained an elderly Palestinian man from inside the Al-Aqsa mosque compound, in occupied East Jerusalem, and banned a youth from entering the holy site, on Monday. The head of the Public Relations office, at the Islamic Endowment Department, reported that the Israeli police detained an elderly man after he had performed prayers at the al-Rahma Gate (Gate of Mercy) area, inside the compound. Israeli settlers had raided the compound via the Moroccan Gate, under armed military security. Additionally, Israeli authorities banned a Palestinian youth, identified as Jihad Qaws, from entering the compound for one week. Qaws said that this ban comes after his last ban of 6 months had just finished. Israeli intelligence also summoned a Palestinian youth, identified as Majed al-Juba, and informed him of the possibility that his ban from entering Jerusalem City could be renewed for 6 months. Al-Juba’s previous ban of 1 year ended on Monday, before he was informed of the possible renewal. According to Ma’an, Al-Juba was also banned from entering the West Bank for an entire year, which would end next Wednesday.